Occupations: I started as a musician and DJ, playing in bands in Camden, London and DJing in the Hacienda, among other places. I then shifted to studio work as a recording and mixing engineer and record producer. I worked on a ton of chart records in the UK and then moved to Canada to explore the music scene. There’s so much musical talent on the West Coast! I’ve also spent the past few years working as a sound designer in video games, film and TV, which has been fantastic and taken me to some exciting places such as Skywalker Sound and House of Moves in California. Passions and Interests: I LOVE producing records! Aside from my sonic obsessions, my passions are playing football as well as food security. My footie team (shout out to Sunshine FC!) play in the Metro Women’s Soccer League, and while we are usually at the bottom of the lowest division, I swear we have more fun than any other team in the league! As well as being a beginner gardener in my back garden, I’m also president of a local non-profit called The Vancouver Fruit Tree Project. In a nutshell, we harvest unwanted backyard fruit and distribute it to those in the community who would not otherwise have access to fresh local food. It’s a very rewarding and much-loved project! What do people know you for? Music, sound, soccer & food security! Thoughts on Vancouver? An unexpected but pleasant adventure in the journey of life! I met my wife in London and shortly after we got together her visa arrived to move to Canada. So it was a ‘now or never’ situation. I thought, “What the heck, let’s give it a go.” We’re still here more than 10 years later so I suppose you could say Vancouver suits me. I can’t think of another place in the world where it’s as easy to be openly gay or trans—or anything for that matter. I love walking around Vancouver and seeing the most eclectic mix of people you’re likely to see in any city, co-existing peacefully and happily. On the downside: the seemingly endless months of rain, the high cost of cheese and the fact you can’t buy a bottle of wine in the same shop you do your groceries. I admire Lin’s passions and the fact that she has worked for a long time in the music business, especially studio work which traditionally is a male-dominated industry. I also admire the glamour of having been a DJ at Manchester’s legendary Hacienda nightclub. We spent time brainstorming about the portrait, wanting to merge Lin’s passion for music and her love of gardening. This sparked the idea for a piano in a rustic urban setting, with Lin wearing a elegant off-white suit. 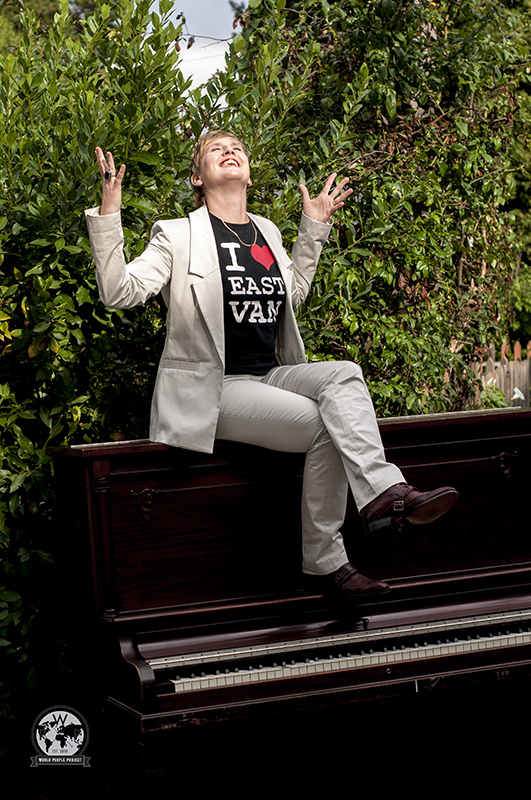 The piano was kindly provided by Silverwood Pianos of Vancouver.